It all started from a single email from Khan Academy. "Tomorrow begins the hour of code!" At first I was confused, but this 'hour of code' seemed to be a very exciting project. And now I'm all the way through Khan Academy's hour of code and finished the Frozen version of coding at www.code.org. Click http://learn.code.org/c/68565598 to see the full version of the game. These blocks help you understand the basic working methods of coding, like repeating an act forever or making things happen at different circumstances. But the colorful puzzle pieces are not used by programmers, of course. They use lines of orders and numbers that might look like error pages. I had a really hard time drawing the crumbs of dirt at the edge of the hole. Now I can draw various shapes like ellipses, rectangles, lines and color them too. It was such an amazing experience to see the bleak panel of numbers turn into something recognizable. It feels completely different from drawing things with Photoshop or Illustrator. I also noticed that the 400*400 pixel sized place where all the shapes formed was a part of a graph of function. It's so cool, stuff I learned in math coming out in reality like this. 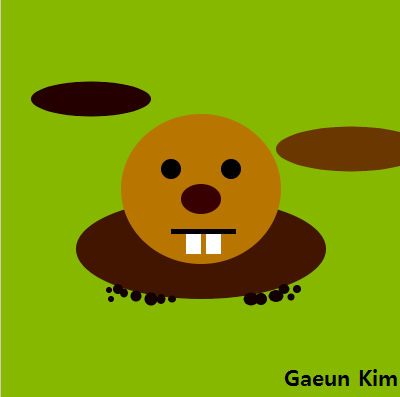 I'm going to keep practicing coding so that I can make the mole a realistic body! Maybe sometime later I might be able to make it move.